Prime Minister Modi has introduced several initiatives to promote growth and 'Skill India' is one of them. It's meant to teach new skills to our people or improve existing skills. Making our people more skillfull is a praiseworthy plan. But what of the existing skills that are being lost? I am referring specifically to the skills of auto mechanics in India. Along with the introduction of modern cars came the modern day showrooms and authorized service centres. Now almost every manufacture has a large authorized service network, and most customers get their cars serviced there. First they go there in the free service and warranty period and then continue to do so, because many spare parts are only available at these centres. They are also the ones who have specialized diagnostic equipment and the special tools mandated by the manufacturer. Such authorized service centres have generated employment and created a new kind of auto mechanic - one who replaces but rarely ever repairs. What do I mean when I say this? Earlier if a car's fuel pump had a problem, the mechanic would dismantle it completely and find the part that was causing the problem. He would rectify the problem, reassemble the pump and refit it. Now at the authorized service centre, the mechanic simply replaces the malfunctioning fuel pump with a new one. He no longer has the skills to repair the part, only replace s it. And it's not just a fuel pump, but almost all parts, big or small, cheap or expensive. Also body parts. Road accidents are very common in India. Earlier if you were involved in a fender bender, the tin smith would sit and take great pain to hammer the panel back into shape. Then body filler would be skillfully applied and the panel painted and made to look like new again. Now in all likelihood, the authorized centre will simply change or replace the entire panel or panels. Of course changing a panel makes sense in cases where repair could compromise the structural integrity or safety of a vehicle. 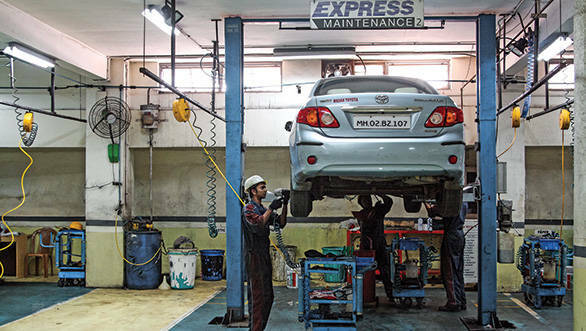 Before the arrival of the authorized service centre, India had a number of highly skilled mechanics. Several of them, the last generation as I refer to them, are still around. But their volume of work is diminishing rapidly and most will disappear in the future. Such skilled mechanics were either employed in privately owned workshops or had their own small shops by the side of the road or on the highways. Such mechanics were so much part of our culture that Bollywood's first superstar Rajesh Khanna even played a roadside mechanic's role in the film Avtaar. These roadside mechanics had the diagnostic skills to zero in on problems and open and take apart faulty parts. Let's say there was a problem with the brake master cylinder and some of the wheel cylinders. These cylinders would be disassembled and if required taken to the neighbourhood turner (a person who fashions or shapes objects on a lathe machine) for resurfacing of the bore, fitting of a sleeve, etc. New wheel cylinder kits comprising of boots, cups, seals and springs would be installed. Every single component that could be repaired would be repaired. Parts were replaced only if they were beyond repair. The mechanic got paid for his labour, and the customer saved on expensive replacement parts. I would like to share some mechanical experiences on the 1999 Jewel of India Rally. This was the first international vintage and classic car rally to be run in India, and I was assisting the British organizers. The event had 20 cars participating and half way through the three-week event, many developed mechanical problems. "Spanners" the official Brit mechanic of the event had his hands full. I assured them that we would get all the cars properly fixed when we reached Hyderabad where we had a rest day. In Hyderabad, I took the participants to the workshop run by my friend Farokh Viccajee. A Jaguar XK 150 had a badly leaking petrol tank, and the owner wanted to drop out of the event. Viccajee got his boys cracking and his tin smith (or pattra wala) fabricated a completely new tank, with buffers and all. To top it, he fabricated a metal fuel tank guard too - the total cost just Rs 3,500! Nobody could believe it. A Volvo Amazon from the 1960's needed a new clutch, engine mounts, shock absorbers, etc. It was fixed too. A 1930's Bentley had problems with the steering. The steering box was opened and repaired. All required repairs were carried out on all the cars. The European participants could simply not believe it. All of them had only one thing to say, "We never knew India had such skilled mechanics". Alas, this is fast changing and we are well on course to lose such repair skills. Having said this, I must also admit that with the rapid changes in technology and introduction of computer units and software in cars, many old timer mechanics have simply not been able to update their skills to keep the pace with present day cars. It's a strange situation, really. While some skills are being lost, part of the loss is also because those very same skills have not been updated and enhanced to meet modern day car requirements.